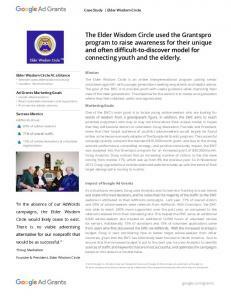 Mission The Elder Wisdom Circle is an online intergenerational program pairing senior volunteers ages 60+ with younger generations seeking empathetic and helpful advice. The goal of the EWC is to provide youth with useful guidance while improving their view of the older generations. The objective for the seniors is to create an organization where they feel validated, useful and appreciated. Marketing Goals One of the EWC’s main goals is to locate young advice-seekers who are looking for words of wisdom from a grandparent figure. In addition, the EWC aims to reach potential supporters who may or may not know about their unique model, in hopes that they will become donors or volunteers. Doug Meckelson, Founder and President, knew that their target audience of youthful advice-seekers would largely be found online, so he became an early adopter of the Google Ad Grants program. The successful campaign quickly outspent the standard $10,000/month grant, and due to the strong account performance, compelling strategy, and positive community impact, the EWC was accepted into the Grantspro program for an increased grant of $40,000/month. Using Analytics, Doug noticed that an increasing number of visitors to the site were coming from mobile: 17%, which was up from 8% the previous year. So in November 2013, Doug upgraded to a mobile-optimized website to keep up with the trend of their target demographic moving to mobile. As a Grantspro recipient, Doug uses Analytics and Conversion Tracking to track trends and make informed decisions, and he notes that the majority of the traffic to the EWC website is attributed to their AdWords campaigns. Last year, 71% of overall visitors and 65% of advice-seekers were referrals from AdWords. With Grantspro, the EWC was able to reach 240% more supporters over the past year, as compared to the referrals received from their standard grant. This helped the EWC serve an additional 8,000 advice-seekers and created an additional 12,000 hours of volunteer service for seniors. Additionally, 15% of donations and 15% of volunteer applications came from users who first discovered the EWC via AdWords. With the increased Grantspro budget, Doug is next considering how to better target advice-seekers from other countries, given that the EWC has historically been focused in North America. And to ensure that the increased budget is put to the best use, he uses Analytics to identify sources of traffic and keywords that are most successful, and optimizes the campaigns based on this data on a routine basis. Founder & President, Elder Wisdom Circle © 2014 Google Inc. All rights reserved. Google Ad Grants and Google Ad Grants logo are trademarks of Google Inc. All other company and product names may be trademarks of the respective companies with which they are associated. Using Analytics, Doug noticed that an increasing number of visitors to the site were coming from mobile: 17%, which was up from 8% the previous year. Using Analytics, Doug noticed that an increasing number of visitors to the site were ... Additionally, 15% of donations and 15% of volunteer applications came. The bassline drops.The magicalcircle.Whatmakes you beautifulOne direction. ... The magicalcircle.The magicalcircle.Assorted mag pdf.The weeknd cant face. ... Elder Scrolls Novel ebook online in EPUB format for iPhone iPad Android Computer and Ã¢â¬Â¦The NOOK Book eBook of the .... Publisher : Del Rey 2009-11-24. Try one of the apps below to open or edit this item. the elder scroll iv oblivion.pdf. the elder scroll iv oblivion.pdf. Open. Extract. Open with. Sign In. Main menu. There was a problem previewing this document. Retrying... Download. Connect more apps... Try one of the apps below to open or edit this item. The-Elder-Scrolls-The-Infernal-City.pdf. The-Elder-Scrolls-The-Infernal-City.pdf. Open. Extract. Open with. Sing you home. ... Descargar Historia del pensamiento polÃ­tico en la Edad Medi ...pdf. Leer en lÃ­nea Historia del pensamiento polÃ­tico en la Edad Me ...pdf. There was a problem previewing this document. Retrying... Download. Connect more apps... Try one of the apps below to open or edit this item. ... work great with iOS Android or MAC PC Play The Circle Audiobook in just minutes ... is hired to work for the Circle, the world's most powerful internet company,.